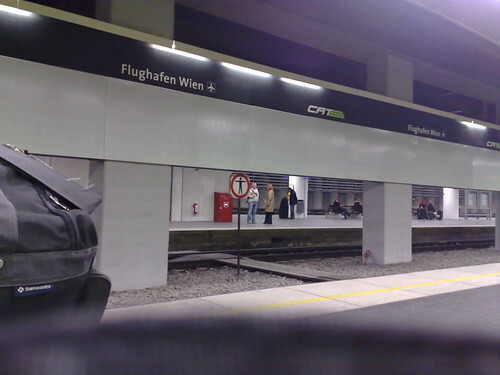 I left for Vienna on Monday Nov 19th. I had packed electronics gear in a Pelican 1620 hardcase, my clothes in a duffle, and had my Timbuk2 as a carry on. Despite my creative redistribution between the bags the case still ended up being 9lbs too heavy. The previous two days I had cleaned the house pretty thoroughly in preparation for my exodus. I showed up at the airport early since they’ve got free wifi, but this practice has become more annoying since they changed the departure gate at least 4 times before we left. The flight to SFO wasn’t bad, but we arrived so late that I was only standing in the terminal 5 minutes before I was getting on the next plane. I lucked out on the flight to Frankfurt; I think I was sitting next to the only empty seat on the plane. The night before, I had checked in online and picked a seat in the only row that was completely empty. The flight was 11 hours, but we got in early. I didn’t sleep much. I spent most of the time listening to an audiobook of William Gibson’s Spook Country. I haven’t read anything written by him in recent years so I was surprised to find the book set very firmly in the now. It covered two of my favorite topics: augmented reality and shipping containers. It was interesting when I first started listening to the book on the way into LA since the story is very heavily location based and was describing LA landmarks. The story was fine, nothing mind-blowing. It did bother me that the words “augmented reality” were never used despite being a major theme. As for the audiobook, I can’t stand characters with French accents. The Da Vinci Code was hard enough and listening to this book was the coffin nail. Please readers, stop “doing” the accent. I was also annoyed by the pronunciation of the word “locative” (it comes up a lot) to sound like “lock” instead of the root “location”. Once in Frankfurt I had to check in at the Lufthansa desk to get my checked bags into the country and then head back through security. So, I was only standing about 10 minutes before boarding my final flight to Vienna. I know I got lucky, so I’m going to give myself longer connections and more breathing room next time. Not too long though; Sean Bonner left LA at the same time as me but arrived 20 hours later. Arriving at 5:30, I picked up my bags and headed in dread towards the big customs-nothing-to-declare sign and not the friendly domestic exit. Of course both doors went to the same area and didn’t have any checks. Later conversations about how obnoxious US customs is would have us telling telling the EU citizens “Oh no, our country hates us too”. I had not one, but two search slips in my case when I opened it. Did the second person feel stupid when he found the first slip? Do they tally false positives just to know how bad they’re doing? I hopped on the U-Bahn and immediately adopted Viennese culture… by not paying. I guess the fine is EU70, but is checked so rarely that noone bothers to pay. There aren’t any turnstiles to enforce it either (and it’s a damn pleasure not have to deal with those things).